Love Spell Type Romantic Flowers Pink Hearts Handmade Artisan Soap is a bath, shower or a facial luxury soap. 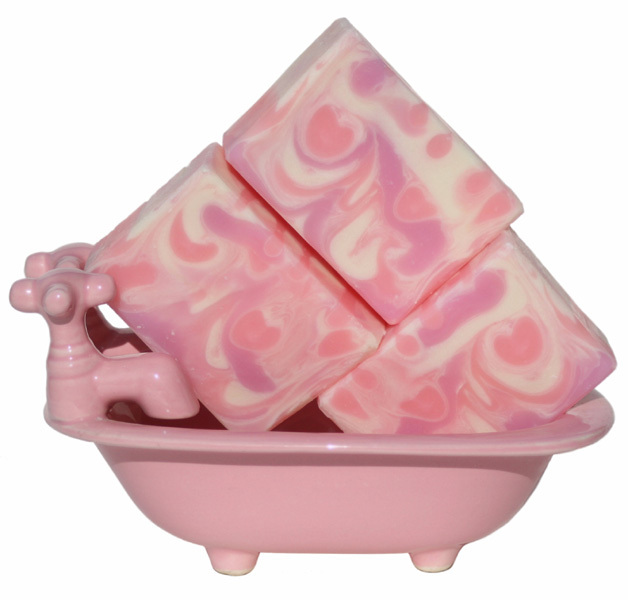 It's perfect for Valentine’s or Mother’s Day with swirls of gentle peach, pink and soft lavender. Love Spell Type Romantic Flowers Pink Hearts Handmade Artisan Soap is a bath, shower or a facial luxury soap that’s perfect for a birthday or Mother’s Day. The fragrance is fresh with soft green notes and fruity floral pink heart. It has notes of luscious bergamot, juicy mandarin, ripe peach, succulent pear, sweet berries, soft musk and precious woods. Surprise your love with soap that has swirls of gentle peach, soft lavender and small pink hearts. You skin needs nurturing to look its best. My handmade bath and body soaps are made with fresh natural ingredients like moisture rich olive oil, coconut for mild cleansing, castor for bubbles and exotic moisturizing mango butter. All soaps are handcrafted using the traditional cold process method and cured for 4 to 6 weeks. Since artisan soaps produce glycerin naturally, they are better for your skin. Love Spell Type Romantic Flowers Pink Hearts Handmade Artisan Soap is made by hand and cut by hand so the color and swirls will vary slightly. The pink hearts in the bars make this soap very unique. Think of this soap as a unique work of art! It is best to let your soap air dry between uses so it will last longer. Love Spell Type Romantic Flowers Pink Hearts Handmade Artisan Soap is beneficial for any type of skin. It is mild and creamy with gentle bubbles. If you enjoy Love Spell type fragrance, you will love this handmade soap with decadent, lavish and lush scent. Buy this soft and sweet bouquet with pink hearts bar for someone special so they can indulge in a relaxing bath or a soothing shower. Love Spell type artisan soap comes packaged in a soap box with a full ingredient list. It’s ready to give as a unique, scented gift. Ginger’s Garden handmade artisan soaps are also available wholesale as cut bars, whole logs or loaves.